2:17pm | The Press-Telegram is reporting that the arraignment of David Cruz Ponce and Max Eliseo Rafael has been postponed to allow for special defense council to be assigned in the capital murder case. The defendants did not enter a plea. January 19, 7:20pm | The Long Beach Police Department has announced that charges have been filed by the Los Angeles County District Attorney’s Office, against two suspects for the murder of five individuals at a homeless encampment in 2008. On Sunday, November 2, 2008, Long Beach police officers were dispatched to the area of Santa Fe Avenue and Wardlow Road regarding a 9-1-1 call where the caller stated that someone had been killed. Officers from the Long Beach Police Department, with the assistance of the California Highway Patrol, searched the thick brush in the area near the Santa Fe Avenue off-ramp of the 405 Freeway. There they discovered the bodies of five deceased individuals that had been shot multiple times in a homeless encampment that contained numerous tents, carpeting, a tarp roof, and other things that made it their home. The five victims were identified by the Los Angeles County Coroner’s Office as Vanessa Malaepule, 34, of Carson, Jose Lorenzo Villicana, 44, Katherine Lynn Verdun, 24, Frederick Doyle Neumeier, 53, of Long Beach, and Hamid Shraifat, 41, of Signal Hill. Long Beach Police Department Homicide Detectives Mark McGuire and Hugo Cortes were assigned this case and began investigating the incident. Due to the isolated encampment, the task of finding witnesses to the incident was difficult. With the assistance of detectives from the Long Beach Police Department’s Career Criminal Apprehension Team (C-CAT), detectives scoured the area contacting potential witnesses. Additionally, detectives worked with the City’s homeless program to identify potential witnesses they may come into contact with. All of these efforts paid off for detectives who were able to recreate each of the victim’s backgrounds to identify known associates through interviews. Within a few weeks of the murders, homicide detectives had identified an unreported incident where Victim Villicana was robbed and assaulted a week prior to the murder by suspect David Ponce, 31, of Lancaster. On November 21, 2008, Los Angeles County Board of Supervisors, at the request of Fourth District Supervisor Don Knabe, offered a $20,000 reward for information relating to this investigation. Over the course of the last 3 years, detectives continued to investigate the robbery and the potential relation to the murders. Detectives were able to establish that there was an ongoing dispute between Victim Villicana and Suspect Ponce, who is a documented gang-member. Detectives believe that this ongoing dispute over a narcotics debt resulted in Suspect Ponce plotting the murder of Victim Villicana, which included him recruiting an additional suspect to assist him. That additional suspect, a documented gang-member of the same gang, is identified as, Max Rafael, 25, of Los Angeles. The investigation revealed that on the day of the murders, Suspects Ponce and Rafael accosted Victim Shraifat while looking for the encampment. At gunpoint, they forced Shraifat to take them to the encampment where Victim Villicana lived. Once at the encampment, Villicana was murdered. The four other victims were also executed to ensure there were no witnesses to the crime. Due to the nature of the crimes, the Los Angeles County District Attorney’s Office assigned Special Deputy District Attorney (DDA) Eric Harmon from the Major Crimes Unit to this case. On January 18, 2012, DDA Harmon filed charges that included murder, kidnapping conspiracy and possession of a firearm by a felon with gun and gang allegations against Suspects Ponce and Rafael. Suspect Ponce was arrested by the Los Angeles County Sheriff’s Department (LASD) in August of 2010 and Suspect Rafael was also arrested by LASD in June of 2011, both for ex-felon with a firearm. The Long Beach Police Department would like to thank the Los Angeles County Sheriff’s Homicide and Major Crimes Units for their assistance in making these arrests. During the course of this investigation, homicide detectives have identified at least three additional murders for which Suspect Ponce may be responsible. Two of these crimes occurred in the downtown area of Long Beach and are still under investigation. The third occurred in the City of Lancaster and was investigated by Los Angeles County Sheriff’s Homicide. The Sheriff’s Department presented this case to DDA Harmon who filed an additional count of murder against David Ponce. Detectives believe that Suspect Rafael may also be involved in additional murders in Los Angeles County. Both of their photos are being released hoping that someone may recognize them for their involvement and will come forward. Anyone who may have any additional information regarding the unsolved murders should contact Long Beach Police Homicide Detectives Mark McGuire and Hugo Cortes at (562) 570-7244. Anonymous tips may be submitted via text or web by visiting www.tipsoft.com. On November 2, 2008, a quintuple murder occurred in the City of Long Beach in a homeless encampment. The investigation started with an anonymous caller who reported the crime. The caller gave a brief description of the location which led California Highway Patrol officers to the crime scene. Arriving officers found 5 people dead from gun shot wounds inside of a homeless encampment along the south bound side of the 405 freeway at the Santa Fe Avenue off-ramp. 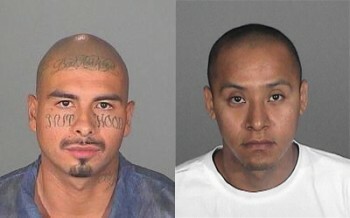 The suspects are believed to also be involved in other murders across Los Angeles County. A $20,000 reward was offered by Supervisor Knabe in 2008 for information related to the shooting. 4:30 | The Press-Telegram is reporting that David Cruz Ponce, 31, and Max Eliseo Rafael, 25, two alleged members of a Watts street gang were charged today with the 2008 shooting deaths of five homeless people killed in an encampment near the San Diego (405) freeway. Ponce and Rafael were each charged with five special circumstance murders in the case, said Deputy District Attorney Eric Harmon. 12:00pm | The Long Beach Police Department has announced that arrests have been made in relation to the murders of five individuals at a homeless encampment near the Santa Fe Avenue offramp of the 405 Freeway, on November 2, 2008.